Doctor Who is one of the BBC's most popular series - for over 50 years the Doctor has entertained, amused and occasionally scared us. If your kids are as bigger fans of The Doctor as we are in our house, your little - or not so little - Doctor Who fan will love to colour in pictures of the Doctor and his companions, friends and deadly foes. So, I sharpened my sonic colouring pencil, hitched a ride in the TARDIS and ventured through time and space - well cyberspace anyway - to track down the best free Doctor Who colouring pictures and printables. If you've got a Doctor Who superfan, why not put together your own Doctor Who Colouring Book using the pictures that we found below? Print off a selection of your favourites, staple or bind them together and hey presto, you have your very own instant colouring book, perfect for wet days at half term. The first stop in our hunt for Dr Who colouring pictures was Official BBC Doctor Who Website. They have a whole section of makes relating to the 11th Doctor played by Matt Smith which includes posters, Christmas cards (!) and colouring pictures of the Doctor, Amy and Rory, plus a Dalek, Silurian and Cybermen. Quick get behind that sofa! Next stop was Doctor Who Makes Torchwood where you can find a couple of fabulously complex pictures to colour along with some pictures including 10th Doctor David Tennant, an Ood and Martha Jones. Bear in mind that as this site is aimed at Torchwood fans, some material on some of the other pages of the site might not be appropriate for younger children. 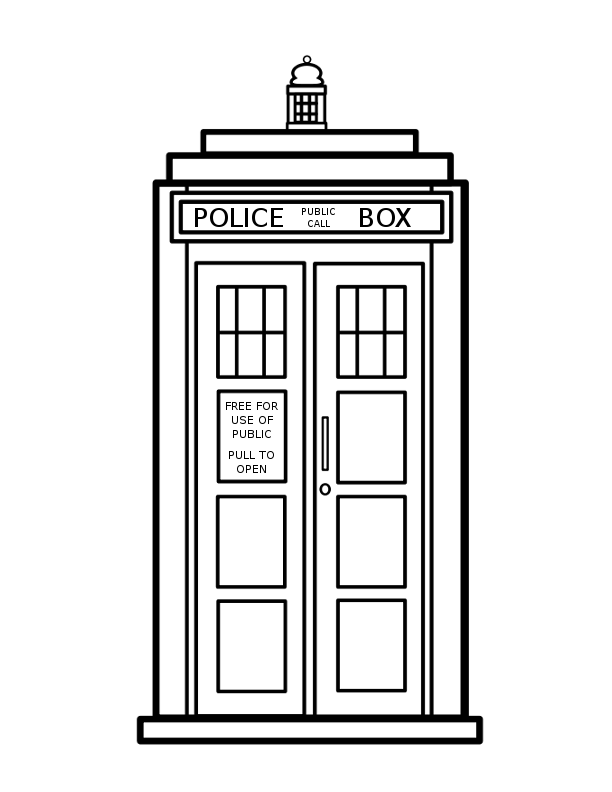 Next we materialised at Deviant Art where you can find this excellent simple TARDIS colouring in picture by Lyssagal. This is the one that I've coloured in at the top of the page. If you colour this in and send it to the artist, your artwork could be featured on her webpage. Deviant Art is clearly a website that is bigger on the inside (sorry) as we also found lot of really cool Doctor Who colouring pictures drawn by jinkies36. There is everything from K-9 to Sec, Judoon, Cats and the Face of Boe. This is a really good collection with subjects that you won't find anywhere else. iChild is a website with a wonderful array of printables on all sorts of topics, and it has lots of Dr Who and space themed educational printables. These are aimed at children in primary school, so are appropriate up to age 11. There are a lot of pictures that seem to turn up on a lot of websites so it is hard to tell if they are official pictures or fan art. These pictures featured at AZ Colouring are found on lots of sites, origin unknown. It looks like this page has been updated regularly and even has some 12th Doctor colouring pictures. A Puzzle for the Doctor - or You? If you would like to stretch your brain as well as your artistic skills, I could just mention that eParenting has a Doctor Who Wordsearch and Anagrams for you to print out and puzzle over too.